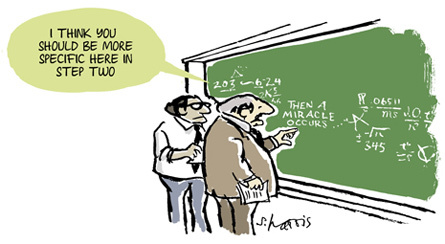 This famous Sidney Harris cartoon (below) captures what is wrong – what is deeply unscientific – about far-too-much modern economics. The miracle assumed by the unscientific ‘scientific’ modern economist is that government will act (1) apolitically, (2) without any of the human imperfections, myopia, and psychological quirks that (are assumed to) give rise to the market imperfections that allegedly justify government intervention, and (3) with more information and wisdom than is discovered and used in markets. All the fabulous ballistics (a term that I understand was used by the late Jack Hirshleifer) that lead up to the miracle and that describe matters following the miracle might well be the flawless products of unquestionable brilliance. But it is simply, deeply, and inexcusably unscientific for economists (or any one, for that matter) to merely assume that government will perform as the social-engineering theory requires it to perform. Put differently, despite more than a half-century of scholarship in public-choice economics, too many economists mysteriously regard warnings about government failing to act ‘perfectly’ as being unworthy or, at least, only of secondary or tertiary significance. It’s unscientific – deeply so.